Ally McCoist UV Olive Lure size 12 (Set of Three). Irish Tied Flies. I tie these Flies with quality and reliability in mind. All patterns are tied on Hayabusa hooks, which are known for their excellent reputation for strength. 3x Hothead Damsel Lure #10 (Set of Three). My flies are tied to the highest standards and therefore I always ensure only the highest quality hooks and materials are used. Each buzzer are finished with 6 coats of varnish in order to give a flawless glossy body. Green/ Black Fritz Lures size 10 (Set of Three). Irish Tied Flies. I tie these Flies with quality and reliability in mind. All patterns are tied on Hayabusa hooks, which are known for their excellent reputation for strength. 3 x Candy Split FABs. Set of 3 Candy Split FABs. Tied on size 8 wide gape barbed hooks. 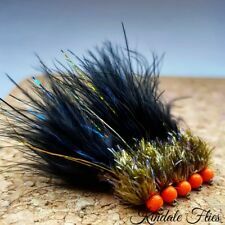 3x Hothead Orange Straggle Fritz Lure size12 (Set of Three). My flies are tied to the highest standards and therefore I always ensure only the highest quality hooks and materials are used. Each buzzer are finished with 6 coats of varnish in order to give a flawless glossy body. 3 x Hulk and Magma Jelly Blobs. Set of 3 Hulk and Magma Jelly Blobs. Tied on size 8 wide gape barbed hooks. 3 x Standard Biscuit Blob’s. Set of 3 Standard Biscuit Blob’s. Tied on size 8 wide gape barbed hooks. 3 x Fluo Yellow and Fluo Orange Halo Blobs. Tied on size 8 wide gape barbed hooks. 3 x Candy Straggle Boobys. Set of 3 Candy Straggle Boobys. Tied on size 10 barbed hooks. Olive Quill Lightweight Buzzers #14 (Set of Three). Irish Tied Flies. I tie these Flies with quality and reliability in mind. All patterns are tied on Hayabusa hooks, which are known for their excellent reputation for strength. 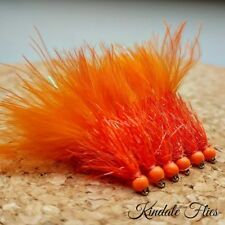 Orange Hothead Red Dancer Lure #10 (Set of Three). My flies are tied to the highest standards and therefore I always ensure only the highest quality hooks and materials are used. Each buzzer are finished with 6 coats of varnish in order to give a flawless glossy body. 3 x Fruit Salad FABs. Set of 3 Fruit Salad FABs. Tied on size 8 wide gape barbed hooks. Olive Quill Cruncher #14 (Set of Three). 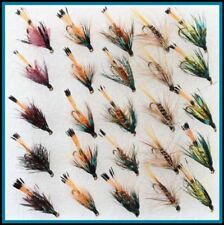 Irish Tied Flies. I tie these Flies with quality and reliability in mind. All patterns are tied on Hayabusa hooks, which are known for their excellent reputation for strength. 3 x Red UV Cormorant Boobys with Red Glister Thorax. Set of 3 Red UV Booby Cormorants with Red Glister Thorax. Tied on size 12 barbed hooks. Green Holo Hopper Cruncher #10 (Set of Three). Irish Tied Flies. I tie these Flies with quality and reliability in mind. All patterns are tied on Hayabusa hooks, which are known for their excellent reputation for strength. Holo Claret Cruncher #14 (Set of Three). 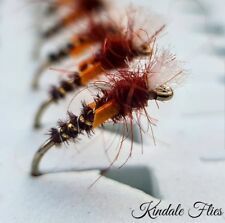 Irish Tied Flies. I tie these Flies with quality and reliability in mind. All patterns are tied on Hayabusa hooks, which are known for their excellent reputation for strength. 3 x Watermelon and Fluo Yellow Blobs with Candy Flash Tails. You can fish these boobies so many different ways. General rule of thump is to Fish these on a fast sinker with a short leader and fish them static. All my flies are tied on quality materials and hooks. 3x Chartreuse Hothead Red / Black Fritz Lure size 10. #12 (Set of Three). My flies are tied to the highest standards and therefore I always ensure only the highest quality hooks and materials are used. That goes for our flies too. We are based in the heartland of Scotland in the Capital City of Edinburgh. Fly fishing opportunities abound in Scotland. Cormorants don't imitate any specific fly, but they can also look like a lot of them. 3 x Neon Sweetcorn FAB’s. Set of 3 Neon Sweetcorn FAB’s. Tied on size 8 wide gape barbed hooks. New listing3 x Fluo Yellow and Fluo Orange Rocket Blobs. Tied on size 10 barbless hooks. That goes for our flies too. 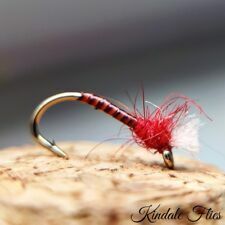 These are a great fly to fish with on a dropper, and can be a good fly to use in a wave, on a drifting boat. We are based in the heartland of Scotland in the Capital City of Edinburgh. I like to fish these using a floating line and long leader and I like to twitch these back. That goes for our flies too. We are based in the heartland of Scotland in the Capital City of Edinburgh. Fly fishing opportunities abound in Scotland. Lightweight Red Quill Buzzers #10 (Set of Three). 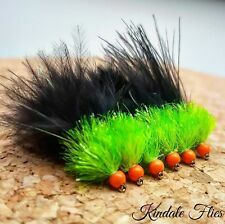 Irish Tied Flies. I tie these Flies with quality and reliability in mind. All patterns are tied on Hayabusa hooks, which are known for their excellent reputation for strength. 3 x Silver and Red Holographic Cormorants. Tied on size 10 barbed hooks. Red Holo Herl Cruncher #14 (Set of Three). Irish Tied Flies. I tie these Flies with quality and reliability in mind. All patterns are tied on Hayabusa hooks, which are known for their excellent reputation for strength. 3 x Bi-Colour Fluo Orange and Fluo Yellow FABs. 3 x Black Mini Blob’s with Sparkle Tails & finished with Spectrum Thread. Olive Cruncher #10 (Set of Three). Irish Tied Flies. I tie these Flies with quality and reliability in mind. All patterns are tied on Hayabusa hooks, which are known for their excellent reputation for strength. I like to fish these using a floating line and long leaderand I like to twitch these back. That goes for our flies too. We are based in the heartland of Scotland in the Capital City of Edinburgh. Fly fishing opportunities abound in Scotland. Quill Cruncher #16 (Set of Three). Irish Tied Flies. I tie these Flies with quality and reliability in mind. All patterns are tied on Hayabusa hooks, which are known for their excellent reputation for strength. 3x Orange Hothead Woolly Bugger Fritz Lure size10. #10 (Set of Three). My flies are tied to the highest standards and therefore I always ensure only the highest quality hooks and materials are used. 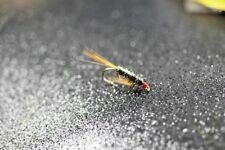 FLY FISHING FLIES BLACK ZULU SIZE 12 BOB CHURCH. A bob church size 12 black Zulu wet fly. The Snatcher style fly is a popular fly and has found its way into many fly boxes worldwide. When fishing the snatcher I like to fish it subsurface in the wave. Tight Lines. That goes for our flies too. 3 x Bi-Colour Fluo Pink and Fluo Yellow Blobs.